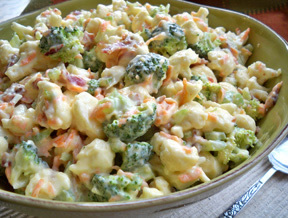 A simple cauliflower and broccoli salad that everyone will love. Whether it is served at a backyard barbecue or for a special holiday dinner, it makes a perfect addition to any meal. 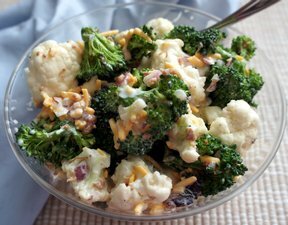 In a large bowl, combine broccoli, cauliflower, onion, bacon, and dried cranberries. In a small bowl, whisk together the salad dressing, vinegar and sugar. Pour over salad and toss to coat. Refrigerate at least 2 hours before serving. Stir in sunflower seeds just before serving. "This salad was very good. 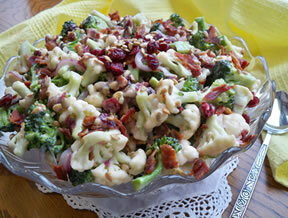 I added the dried cranberries and they really added flavor and nice texture to the salad. We loved the bacon in the salad also. 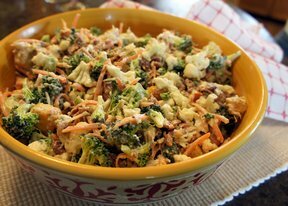 I have this type of salad before but it has never had that much bacon in it."